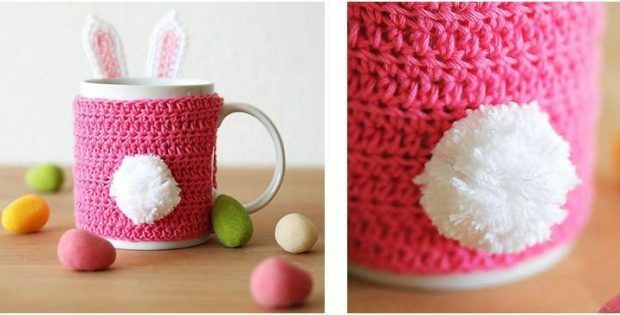 Make this Easter bunny crocheted mug cozy for friends and family. It’s so irresistibly cute everyone will fall in love with it instantly! The pattern for this adorable Easter bunny mug cozy is ideal for confident beginners. Once finished, the Easter bunny mug cozy should be about 3.5 inches in height and 3 inches in diameter. In metric units, the completed crocheted bunny mug cozy should be around 9.5 cm tall with a diameter of about 8 cm. The pattern for this adorably cute crochet Easter bunny mug cozy is a design by Kirsten Ballering. In fact, you can access the FREE pattern for this wonderfully crafted Easter bunny crocheted mug cozy. To access the FREE pattern for this cute and fluffy crocheted mug cozy, please click on this link: Easter Bunny Mug Cozy Pattern. Featured image: Haak maar Raak – thank you!